I handed in my thesis draft last week. (!!!) One step closer to the end and that scary thing that is life beyond a PhD. I’m still ages away from actual hand-in. The thing about having a draft means that you realise how much more work there is to do – reviewing and rewriting, rereading and rewriting, not to mention those pesky publication articles that need doing. But it feels pretty good to finally have something to work with and to have the first big step towards the end accomplished. To celebrate, I’ve been back in the kitchen, baking. This afternoon I finished some mince pies for the freezer and made a batch of gingerbread reindeers and stars. I have the ingredients to try and make my own panettone this week (watch this space!). It’s fair to say that I am embracing Christmas in a big way this year. And am taking some time out from academic writing to, hopefully, do more writing here. So, these mince pies. The pastry I use is one I was given at the SA Chefs Academy by Sam Waring. She was the pastry chef who stretched the basic cake-baking skills I had into something usable. Ever since she taught us this pastry recipe, I have used nothing else. And, to be frank, other mince pie pastry pales in comparison. Once you’ve succeeded with this, you will never go back to ordinary sweet pastry. This pastry is a slightly messy affair. In a nutshell, you soften some butter, add in sour cream, give it a swirl, then add in flour until it forms a sticky dough. This you then turn out onto a floured surface and knead, adding in more flour until you have a smooth dough. You then rest the dough for an hour, roll it out, book-fold it twice (as if you were making puff pastry), rest it again and then roll it out and cut rounds for your tin. Simple right? It does take a bit of getting used to, but it makes wonderfully flaky pastry that is perfect with fruit mince. Obviously, you can make your own fruit mince. I have aspirations to do so at some point in my life, but not this year. This year I used store-bought fruit mince – some from M&S and some from Sainsbury’s. I’ll have to sample both before I let you know which is better. Add in the flour and mix with a wooden spoon until the dough starts to come together. This takes a while and it may look like there is too much flour, but keep stirring and turning and eventually all the flour will be absorbed. Turn out onto a floured surface and knead until smooth. You will notice that the dough becomes sticky as you knead. Keep adding in extra flour until you have a reasonably smooth, unsticky dough. Don’t overwork the dough at this stage. It is preferable that it be mainly smooth and a little sticky. Wrap this in clingfilm and refrigerate for an hour. Have some tea while you wait. Then, once the hour is up, unwrap the dough, and place back onto the floured surface. (I don’t bother with cleaning up in-between all the kneading and rolling and folding.) Roll the dough out into a rectangle, so that the shorter sides are closest and furthest away from you. Book fold this – fold the top end into the middle and then fold the bottom end up to meet it. Then fold this closed. Quarter turn and refrigerate for another hour. Preheat the oven to 180C if you are going to bake them straight away. Now roll out the dough until it is approximately 1/2cm thick. Cut it into rounds, to line the base of a small muffin tin – I use a 68mm cutter. (I like bite-size mince pies. If you like yours bigger than this, say in normal muffin tins, use a 88mm one.) 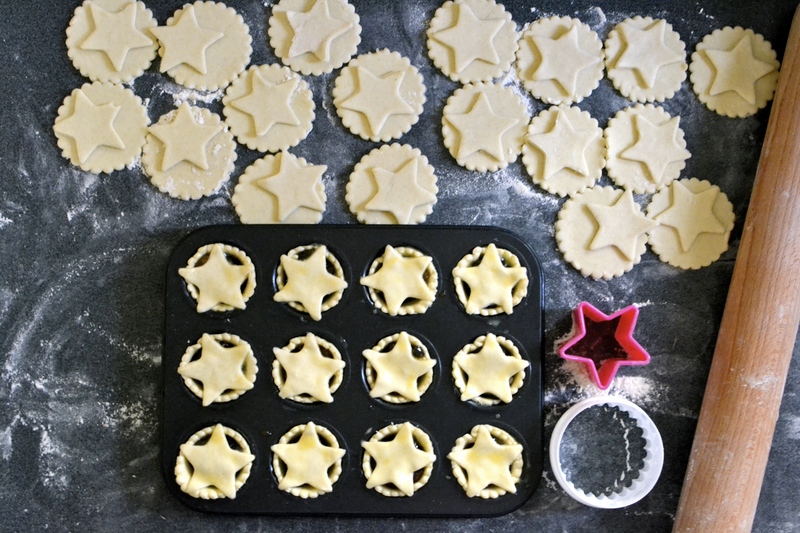 I also like star-topped mince pies and so use some of the pastry to cut stars for the top. The pies can be frozen, in the tin, at this point. I freeze them in the tin for 2-3 hours, then turn them out of the tin and place them in plastic bags of 12 in the freezer. If you are baking them, bake for approximately 15 minutes, until the pastry is golden and slightly puffed. Remove from the oven and allow to cool for 10 minutes in the tins before turning them out. Best eaten warm.